With some $6.4 trillion in global sales in 1994 (and estimated global sales of $7 trillion in 1995) — the value of goods and services produced by some 280,000 foreign affiliates — international production outweighs exports as the dominant mode of servicing foreign markets (table 1). The growth of global sales has exceeded that of exports of goods and services by a factor of 1.2 to 1.3 since 1987. But as far as developing countries are concerned, despite their growing involvement in international production — of the world’s 44,000 parent firms, 7,900 firms were based in developing countries in the mid-1990s (table 2), compared to 3,800 in the late 1980s — exports continue to be the principal mode of delivering goods and services to foreign markets. The gross product of foreign affiliates, a measure of their output, almost tripled between 1982 and 1994, and its share of world output rose slightly, from 5 per cent in 1982 to 6 per cent in 1994. In developing countries, the output of foreign affiliates has contributed (in 1994) more to gross domestic product than it has in developed countries: 9 per cent compared to 5 per cent. The global FDI stock, a measure of the investment underlying international production, increased fourfold between 1982 and 1994; over the same period, it doubled as a percentage of world gross domestic product to 9 per cent. 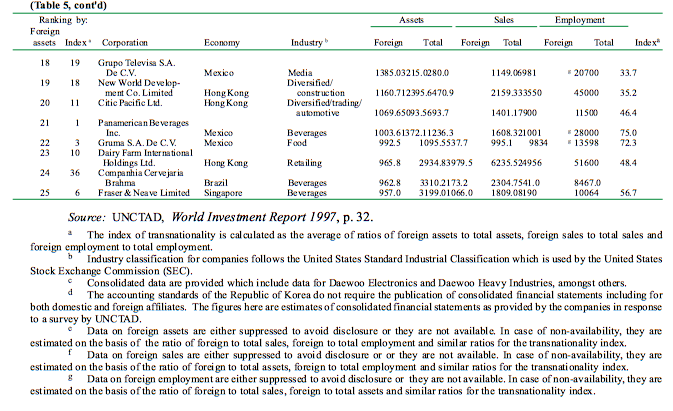 In 1996, the global FDI stock was valued at $3.2 trillion. Its rate of growth over the past decade (1986- 1995) was more than twice that of gross fixed capital formation, indicating an increasing internationalization of national production systems. 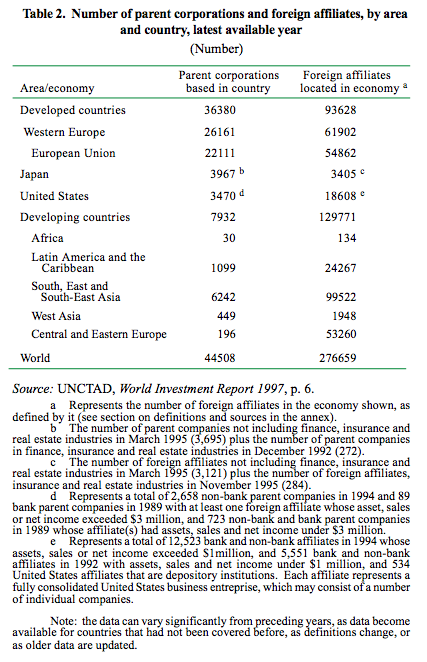 The worldwide assets of foreign affiliates, valued at $8.4 trillion in 1994, also increased more rapidly than world gross fixed capital formation. The upward trend manifested in all of the indicators of international production, in absolute terms as well as in relation to various macroeconomic indicators, suggests that international production is becoming a more significant element in the world economy. Its importance is apparent in the activities in which TNCs are involved. On the technology side, for example, an estimated 70 per cent of the global payments of royalties and fees constitute transactions between parent firms and their foreign affiliates. … was manifested in 1996 in the $1.4 trillion worth of investment in foreign affiliates. Returning to FDI flows themselves, the boom that began in 1995 continues, with inflows setting a new record of around $350 billion in 1996, a 10 per cent increase (figure 2). Fifty four countries on the inflow side and twenty countries on the outflow side set new records in 1996. Unlike the two previous investment booms in 1979- 1981 and 1987-1990 (the first one being led by petroleum investments in oil producing countries, and the second one being concentrated in the developed world), the current boom is characterized by considerable developing-country participation on the inflow side, although it is driven primarily by investments originating in just two countries — the United States and the United Kingdom. There are signs that an even greater number of countries will take part in the present boom as it unfolds on the inward side (e.g., developing countries in Latin America), as well as on the outward side (e.g., France, Germany and Asian developing countries). 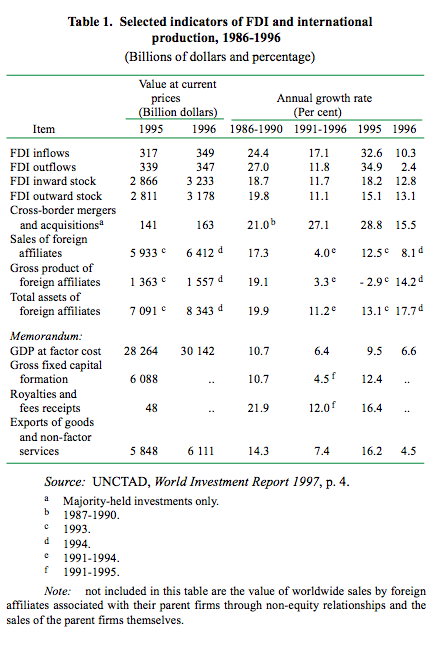 During 1995-1996, the share of developing countries in global inflows was 34 per cent. Although this is not much higher than the developing-country share during the investment boom at the beginning of the 1980s, qualitatively it reflects a wide variety of location-specific advantages enjoyed by developing countries over and above natural resources. The composition of the top developingcountry recipients has also changed dramatically between these two investment booms, with oil producing countries now featuring far less prominently among the top recipients. Interestingly, the developing-country share of global inflows has been on the rise during the current boom, while during the 1987-1990 boom it declined. That decline went hand in hand with a boom in intradeveloped country mergers and acquisitions (M&As), at that time in response to heightened protectionist pressures in key developed countries. As in earlier FDI booms, the bulk of FDI flows goes to a limited number of developing countries. Even in the current boom, cross-border M&As, especially in the United States and Western Europe, are playing an important role in boosting FDI, although this time there is no ensuing decline in the developing-country share of inflows. The value of such M&As increased by 16 per cent in 1996, to $275 billion. 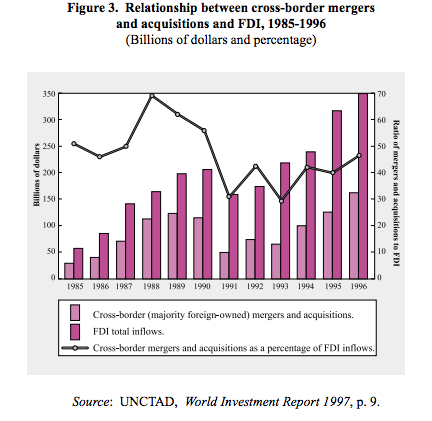 If majority-held transactions only are taken into account, the value of cross-border M&As in 1996 would be $163 billion, or 47 per cent of global FDI inflows (though the measured values are not strictly comparable) (figure 3). Complementing the increases in M&As and FDI flows, the number of cross-border inter-firm agreements (equity and nonequity, other than strategic research-and-development (R&D) partnerships) has also increased. In 1995, nearly 4,600 such agreements were concluded, compared with about 1,760 in 1990. These agreements take place primarily between firms based in developed countries: United States firms participated in 80 per cent of them, European Union firms in 40 per cent and Japanese firms in 38 per cent. Recently, firms based in developing countries have also begun to conclude such agreements actively. The number of crossborder inter-firm agreements (other than strategic R&D partnerships) with developing-country firm participation has increased in absolute numbers, as well as a share of the world total (from 27 per cent during 1990-1992 to 35 per cent during 1993-1995). Although there was a decline in 1995, the number of strategic R&D partnerships (in core technologies, such as information technologies and biotechnology), has also been rising steadily since 1990. Again, developing-country firms assumed a bigger role in strategic partnerships (3 per cent in 1989 to 13 per cent in 1995), suggesting that these firms may have attained sufficient technological sophistication and capacity to make them worth having as partners. … and with an increasing transnationalization of the largest TNCs based in both developed and developing countries. Despite the growing number of small and medium-sized enterprises with investments abroad, a good part of FDI continues to be concentrated in the hands of a small number of companies. 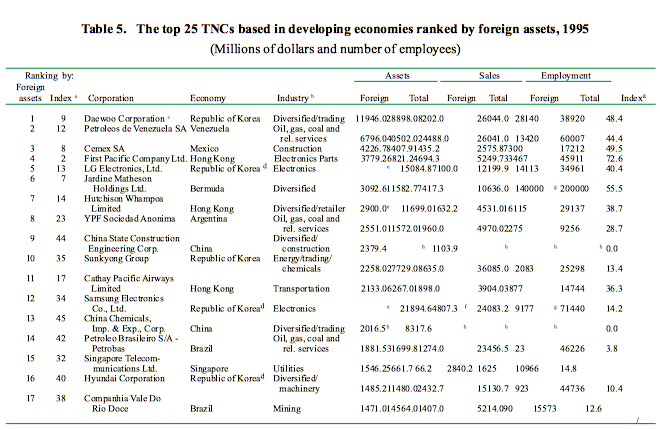 The largest 100 TNCs (table 3), ranked on the basis of the size of foreign assets, own $1.7 trillion assets in their foreign affiliates, controlling an estimated one-fifth of global foreign assets. In the United States, 25 TNCs are responsible for half of that country’s outward stock, a share that has remained almost unchanged during the past four decades. For six out of nine developed countries for which such data are available, 25 TNCs account for more than a half of their respective countries’ outward stocks (table 4). For the first time, two developing-country TNCs, Daewoo Corporation (Republic of Korea) and Petroleos de Venezuela S.A. (Venezuela), have entered the list of the top 100 TNCs. Daewoo Corporation also tops the list of the 50 largest TNCs based in developing countries (table 5) for the second year running, while Royal Dutch Shell (United Kingdom/Netherlands) continues to top the list of the largest 100 TNCs for the fifth consecutive year. 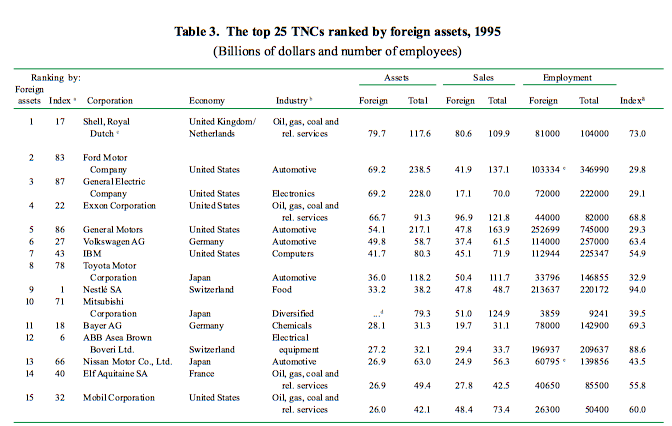 With foreign sales amounting to $2 trillion and foreign employment close to 6 million persons in 1995, the largest 100 TNCs are prominent actors in international production. The top 50 TNCs based in developing countries, however, are catching up. While their foreign assets totalled only $79 billion in 1995, the increase in these assets between 1993 and 1995 was 280 per cent — compared with 30 per cent for the top 100 firms. Both the top 100 TNCs worldwide and the top 50 developingcountry TNCs are becoming more transnationalized, at a faster rate in the latter case. The food firms in the list of the top 50 developingcountry TNCs exhibited the biggest increase in transnationality (measured on the basis of a combined index of the ratios of foreign assets, foreign sales and foreign employment in their respective totals) — from 16 per cent in 1993 to 37 per cent in 1995. On the whole, smaller firms tend to be more transnationalized than larger ones; for example, Solvay SA (Belgium) ranked seventy-fourth on the basis of the size of foreign assets, but ranked fifth on the basis of the transnationality index in the list of the top 100 TNCs. And Panamerican Beverages Inc. (Mexico) took the first place in the list of the top 50 developing-country firms on the basis of the transnationality index, as opposed to twenty-first on the basis of the value of foreign assets. The Triad (European Union, United States and Japan) is home to 87 per cent of the top 100 TNCs and accounts for 88 per cent of their foreign assets. Likewise, China, the Republic of Korea, the Hong Kong Special Administrative Region of the People’s Republic of China (hereinafter: Hong Kong, China) and Mexico are home to 56 per cent of the top 50 firms based in developing economies, and account for two-thirds of their foreign assets. Electronics is the most important industry as far as the largest TNCs are concerned, accounting for some 16 per cent of all firms’ foreign assets in each of the two lists of top TNCs. Automotive and chemical firms also feature prominently in both lists, but more so in the list of the top 100 firms. Petroleum and mining firms, although few in number, tend to rank high in both lists. The expansion of international production would not have been possible if it were not for the ongoing liberalization of FDI regimes. 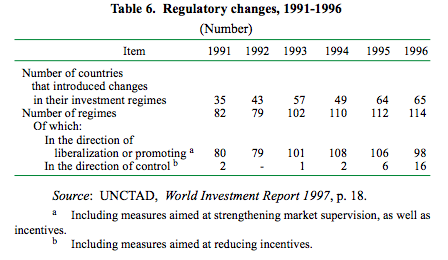 The trend towards greater liberalization was sustained again in 1996, with 98 changes in the direction of investment liberalization and promotion of a total number of 114 changes in investment regimes introduced during that year in 65 countries (table 6). 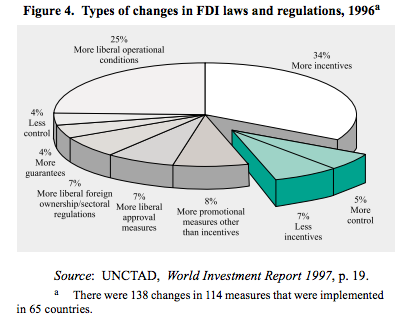 Over the period 1991-1996, indeed, some 95 per cent of a total of 599 changes in the regulatory FDI regimes of countries were in the direction of liberalization. They mostly involved the opening of industries previously closed to FDI, the streamlining or abolition of approval procedures and the provision of incentives (figure 4). 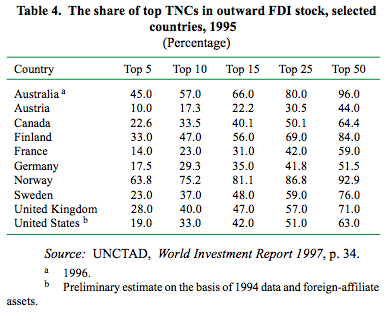 The desire of governments to facilitate FDI is also reflected in the dramatic increase in the number of bilateral investment treaties (BITs) for the protection and promotion of investment throughout the 1990s. As of 1 January 1997, there were 1,330 such treaties in the world, involving 162 countries, a threefold increase in half a decade. Around 180 such treaties were concluded in 1996 alone — one every second day. The pattern of these treaties has changed considerably in recent years. While virtually all BITs used to have one developed country as a partner, and such countries took part in 83 per cent of all such treaties as of the end of the 1980s, by 1996 only 62 per cent of the world total involved developed countries. Indeed, countries in Central and Eastern Europe and developing countries have begun to conclude BITs among themselves. At the beginning of 1997, 16 per cent of all BITs were among developing countries, rising from 11 per cent at the end of the 1980s. In 1996 alone, nearly a third of all BITs were concluded between developing countries, led by China, Chile, Algeria and the Republic of Korea. New ground is being broken at the regional and multilateral levels. Negotiations on an investment framework are taking place in the Organisation for Economic Co-operation and Development, with the conclusion of a free-standing Multilateral Agreement on Investment rescheduled for May 1998. In the framework of the discussions on a possible Free Trade Area of the Americas, a Working Group on Investment has been established, as well as a Working Group on Competition Policy. In the meantime, the Ministerial Meeting of the World Trade Organization in Singapore in December 1996 established two working groups to examine the relationship between trade and investment and between trade and competition policy. Independently of these developments, the ASEAN members are preparing to launch the ASEAN Investment Area. Cooperation among ASEAN members in the area of investment has already progressed with the signing of a protocol (in September 1996) updating the 1987 ASEAN Agreement for the Promotion and Protection of Investment. … and holds good prospects for being sustained into the next century. The ongoing globalization of production begs the question of whether the upward trend in FDI flows witnessed to date will continue into the next century. A survey of foreign investors suggests that this may, indeed, be the case. More specifically, foreign sales are expected to increase as a proportion of total sales, especially for Japanese and United States’ firms. Production by foreign affiliates is also expected to increase as a proportion of total production by TNCs, while home-country exports are expected to remain constant. Mergers and acquisitions, joint ventures and other equity and nonequity types of inter-firm agreements are expected to go hand in hand with the growth in FDI. Although smaller firms will be stepping up investments abroad, large firms will continue to account for the lion’s share of outward investments. Corporate restructuring in developed countries, aimed at improving efficiency and modernization, is expected to continue, giving rise to efficiencyseeking investment. However, accessing markets will remain the principal motive for investing abroad: survey respondents placed twice as much weight on production for local markets than on labour cost factors. Countries in developing Asia and, to a lesser extent, in Latin America and Central and Eastern Europe, are likely to be the main beneficiaries of the corporate restructuring. Investment at home generally will be given a lower priority than it has received until now. In contrast, investment in the same region will continue to be significant, while investment in more distant countries is likely to increase, thus broadening the geographical scope of international production. Foreign investors foresee dramatic increases in investments in infrastructure, distribution, non-financial services and automobiles, but slower growth in financial services and real estate. All in all, the growth of FDI is expected to remain brisk over the next five years, both in terms of absolute levels and as a proportion of corporate investment. Developed countries’ investments abroad reached an all-time high of $295 billion in 1996. The investment picture for developed countries is dominated by the United States, which, with $85 billion is by far the largest home country (by a margin of $31 billion over the United Kingdom, the second largest home country), as well as, with $85 billion, the largest recipient country (by a margin of $42 billion over China, the second largest recipient) in 1996 (figure 5). Around two-fifths of United States outflows go to the European Union and around 30 per cent to developing countries. Growing consumer markets have encouraged United States investments in the latter, while sluggish growth in the former has led to a decrease in its share of United States outflows. Investment flows into the United States — mostly in the form of M&As — were stimulated by its strong and sustained growth performance and potential for high profits. Western Europe received $105 billion in inflows and invested $176 billion abroad in 1996. More European Union investment is now directed to non-European Union countries than in 1992, when the internal market was completed. These countries are investing increasingly outside Western Europe, mostly in North America, developing Asia and, to a lesser extent, Central and Eastern Europe. Nearly a half of the European Union’s investment outflows take the form of M&As. The share of European Union inflows accounted for by M&As, however, is considerably smaller because of regulatory and other barriers in existence in some countries (such as Italy and Germany) on this mode of investment. Japanese investment in the European Union is declining — to almost $2 billion in 1994, compared with nearly $7 billion at its peak in 1990. Overall, however, the recovery of Japan’s outward investment continues, with outflows reaching $23 billion in 1996, slightly over half their peak level of $41 billion during 1989-1991. (It should be noted that reinvested earnings, estimated at $14 billion in the manufacturing sector alone in 1994, are not included in these figures.) Japanese outflows are geared overwhelmingly towards developing Asia and the United States. But in Asia, China is no longer the favourite location and, in fact, its share of Japanese outflows declined in 1996. Brazil is beginning to receive Japanese investment, with Japanese outflows there (on the basis of notifications) tripling in 1996 over 1995. On the inward side, Japan remains a small FDI recipient, with inflows declining to $220 million in 1996. … but developed countries are becoming, on the whole, less important hosts. 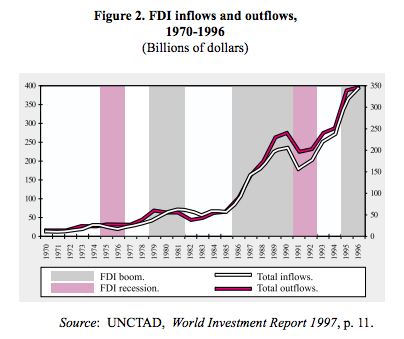 Although developed countries received a record $208 billion in FDI flows in 1996, there has been a steady decline in their share of global inflows since 1989. That decline can be attributed partly to the increasing attractiveness of developing countries, especially those that are growing rapidly and have large domestic markets. Furthermore, some developed countries that are large outward investors are small investment recipients, especially in relation to the size of their economies; notable examples are Germany, Italy and Japan. And as the rationalization of production through FDI in response to regional integration arrangements among developed countries (notably, the European Union) has reached a high level, firms are turning increasingly towards untapped markets found mostly in the developing world. In light of the above, it is not surprising that developing countries received $129 billion of FDI inflows in 1996 and invested $51 billion abroad — both amounts are all-time highs. Their share of world inflows rose to 37 per cent in 1996 (from 30 per cent in 1995), while their share of outflows was 15 per cent in that year. With $42 billion, China was the largest developing-country recipient (figure 5); the country’s success can be attributed mostly to its large and growing domestic market, “soft landing” and macroeconomic reforms, as well as to measures to promote investment in provinces other than those in the coastal areas. Every developing region saw an increase in inflows. Even the 48 least developed countries experienced an increase in inflows of 56 per cent in 1996, to $1.6 billion. Cambodia was the largest recipient in this group of countries. In addition, and despite the small size of inflows (both in absolute values and as a share of all developingcountry inflows), FDI is very important for many of these economies; inflows in as many as eight countries reached 10 per cent as a share of gross fixed capital formation in 1995. Within the group of the least developed countries, there are significant disparities in performance as regards FDI. The Asian least developed countries are benefiting from the Asian industrializing economies’ process of industrial restructuring in the framework of the “flying-geese” model, not only because they offer complementary locational advantages in the form of low-cost labour, but also because of their geographical proximity to them. More than four-fifths and nearly two-fifths, respectively, of cumulative investments received by Bangladesh and Myanmar over the period 1990-1994, for example, came from developing Asia. Since a similar “in-tandem” restructuring process is not taking place in Africa, the least developed countries in that continent do not have the same opportunity to benefit from the type of intra-regional FDI inflows that is the outcome of this process in Asia. With $81 billion in inflows in 1996, South, East and SouthEast Asia received about two-thirds of the developing-country total in that year. The 25 per cent increase in these inflows over 1995 was also in sharp contrast with the large decline in the rate of growth of exports and, to a lesser extent, of the gross domestic product, in that year. China accounted for over two-fifths of the $16 billion increase in investment inflows in the region. Next to China, Singapore was the second largest investment recipient, with inflows worth $9 billion, exceeding the combined inflows of the other newly industrializing economies (Hong Kong, China, Republic of Korea and Taiwan Province of China). Flows into Hong Kong, China, were $2.5 billion in 1996. Foreign-investor confidence in Hong Kong, China, after its reversion to China on 1 July 1997 is strong, as indicated by a number of surveys of foreign (and local) companies. Indonesia, Malaysia, Philippines and Thailand together received some $17 billion in 1996, an increase of 43 per cent over 1995. Together, ASEAN members have, however, seen their share of the region’s investment inflows decline, from 61 per cent during 1990-1991 to below 30 per cent during 1994-1996, attributed to domestic capacity constraints, infrastructure bottlenecks and, in particular, stiff competition from other economies. A 34 per cent increase in investment flows to India (to $2.5 billion) pushed total inflows to South Asia to $3.5 billion. Investment from other Asian economies in India, especially from the Republic of Korea, are outstripping those of some developed countries, such as the United States and the United Kingdom. South, East and South-East Asia are emerging as important outward sources of FDI. Indeed, the region is the largest source of FDI in the developing world, with outflows increasing by 10 per cent in 1996, to $46 billion. Hong Kong, China is the single largest outward investor ($27 billion in 1996). Recently, the geographical scope of developing Asia’s outward FDI has expanded to include non-traditional destinations, such as the European Union, Central and Eastern Europe and Africa. The extent to which Asian developing economies are transnationalized is reflected in the increasing ratios of investment outflows to gross fixed capital formation for the region as a whole, as well as for individual economies. That ratio, for example, is higher for Singapore (14 per cent) and Malaysia (11 per cent) than for Western Europe (10 per cent) and the United States (9 per cent). Investment flows into Latin America and the Caribbean increased by 52 per cent in 1996, the highest increase of any developing region, to a record level of nearly $39 billion. Far-reaching changes in the region’s FDI regimes — both at the national level and through the conclusion of bilateral investment treaties — have certainly contributed to this performance. Even during the turbulence in portfolio investment flows into that region in 1994 and 1995, FDI flows registered small but steady increases. Latin America and the Caribbean now account for 30 per cent of all developing country inflows. Investment inflows into Argentina tripled in 1996 to $4.3 billion, propelled by the country’s membership in MERCOSUR (which contributed particularly to automobile investments), the liberalization of mining legislation and privatization schemes. But the most noteworthy performance has been that of Brazil. With nearly $10 billion, Brazil has surpassed Mexico (with around $8 billion) as the star performer in Latin America in 1996. (In the first four months of 1997, inflows were over $4 billion — two and a half times higher than inflows in the same period in 1996.) This represents a dramatic reversal: in 1992, with $2 billion, Brazil ranked third in the region (after both Mexico and Argentina). The upswing in Brazil’s inflows is the outcome of large investments in automobiles (in the context of intra-regional production rationalization triggered by MERCOSUR) and the reactivation of its privatization programme. Foreign-investor confidence in Brazil (and in the region as a whole) is high: in a recent survey, company executives expressed more confidence in Latin America’s prospects now than five years ago, placing Brazil, Mexico and Chile in top places. The United States remains the foremost foreign investor in the region, with firms investing now more heavily in Brazil than in any other country there. Canada’s investment in Latin America and the Caribbean is also sizeable, but concentrated mostly in mining and exploration. Western Europe’s investment in Latin America and the Caribbean (largely from Germany and Spain) is on the rise, and is mostly directed towards Brazil, Argentina and Mexico (in natural resources and services). Almost a half of Western Europe’s investment into that region has come through privatization schemes, but in 1995 and 1996 greenfield investment has also been prevalent in automobile manufacturing. Japanese investment in Latin America remains small and highly concentrated in tax havens in the Caribbean. Intra-regional investment has increased substantially, with Chile, Brazil and Argentina being the principal source countries, and Argentina, Peru and Venezuela the principal destinations. Developing Asian countries continue to invest in export-related industries, although market-seeking investments spurred by the region’s recent integration efforts are also on the rise. Africa continues to receive small levels of investment flows (nearly $5 billion in 1996), an increase of only 5 per cent, the smallest of any developing region. On average, Africa’s share of developingcountry inflows has more than halved between 1986-1990 and 1991- 1996 — to 5 per cent in the latter period. Political unrest, armed conflict, low domestic investment levels and frequent changes in economic policies that affect business calculations of expected risks and returns have contributed to this relative decline. However, Africa’s investment performance looks less gloomy when put into perspective. In relation to the size of a number of economies, those investments can be fairly significant. For the region as a whole, the ratio of investment inflows to gross fixed capital formation was 5.4 per cent, compared with 5.5 per cent for Asia and 5.9 per cent for Western Europe during the first half of the 1990s. Putting the size of Africa’s FDI stock in relation to the size of Africa’s domestic market (GDP) yields a share of 10 per cent — compared with 14 per cent for Asia, 18 per cent for Latin America and the Caribbean and 13 per cent for Western Europe in 1995. While these figures suggest that the significance of the investment that Africa receives (without the benefit of large intra-regional investment) is certainly not negligible, they do not say anything about Africa’s need for investment nor, for that matter, the continent’s potential. Prospects for increased flows to some parts of Africa are encouraging. Favourable growth performances, further investment and trade liberalization and privatization, regional cooperation agreements and the establishment of links with other regions are all likely to increase the region’s attractiveness. In addition, South Africa could begin to play a significant role as a “growth pole”, contributing to the region’s economic development through FDI and trade. As regards the former, South Africa’s contribution could be through the provision of investment capital, adding to capital formation in the recipient economies; the transfer of technology; the development of local human resources; and the opening up of its own market to the exports of foreign affiliates that have invested in neighbouring economies. Indeed, the question has arisen whether South African firms can induce the development of new industries, especially in manufacturing, in its neighbours by establishing an intra-regional division of labour in the framework of which production at home is upgraded to capital- and technology-intensive activities. In this “flying geese” process of industrial restructuring and upgrading, South Africa would play the lead role, similar to the role played by Japan in the context of Asia’s development. At this point in time, however, it appears that the necessary conditions for this type of intra-regional restructuring to occur are still far from being met, including — to stay within the metaphor — because many of South Africa’s neighbours are still in the “nest-building” stage. After large disinvestments in West Asia in 1995 that resulted in negative inflows, particularly in Saudi Arabia and Yemen, inflows attained a level of nearly $2 billion in 1996. Excluding these two countries, investment flows into West Asia show a much more stable trend. In fact, the volatility of inflows to these two countries — albeit important ones — masks considerable improvements in the investment performance of other countries in the region in response to successful efforts to create business-friendly environments. Over time, the share of West Asia in total developing country investment inflows has been declining — from 30 per cent during the first half of the 1980s to only 2 per cent during the first half of the 1990s. That shift reflects largely decreasing investment flows to oil producing economies (Saudi Arabia, Oman, Qatar and United Arab Emirates). While petroleum naturally remains the most popular industry in these economies, in the non-oil producing countries (Jordan, Lebanon and Turkey) investments go mainly to manufacturing and services. … while a slow-down in privatization contributed to a decline in FDI flows to Central and Eastern Europe. In 1996, FDI flows to Central and Eastern Europe experienced a decline — to $12 billion from $14 billion in 1995, partly reflecting declines in privatization-related investments in Hungary and the Czech Republic. As long as investment flows to that region depend to a large extent on the participation of foreign investors in privatization programmes, a certain degree of “lumpiness” — yearto-year volatility — is to be expected. The decline might also stem from other problems related to the transition to a market economy. Foreign investors, for example, might have overestimated the region’s ability to absorb investments and might have temporarily shelved their plans for expansion. However, despite the decline, flows in 1996 were still more than twice as high as the annual average during 1992-1994. The estimated FDI stock in Central and Eastern Europe was $46 billion in 1996 — almost comparable to the 1996 investment flows to China ($42 billion). Investment flows to Central and Eastern Europe remain concentrated in the Czech Republic, Hungary and Poland, together accounting for some two-thirds of the region’s inflows (figure 5). Transnational corporations from Western Europe dominate the investment picture, followed by corporations from the United States and, more recently, the Asian newly industrializing economies. A small but growing share of inflows is attributed to corporations based in Central and Eastern Europe itself. This is also reflected in the fact that 16 per cent of the BITs concluded by Central and Eastern European countries has been with other countries in the same region. Substantial flows of foreign portfolio equity investment to emerging markets is a recent phenomenon dating only from the early 1990s. The year 1993 was the watershed for such flows when their level trebled, to $45 billion, from the previous year. However, the level of these flows fell in the two subsequent years in response to the Mexican peso crisis — by 27 per cent and 2 per cent in 1994 and 1995, respectively — but recovered in 1996. The volume of new equity raised on international capital markets by emerging markets in that year increased by 34 per cent, reaching some $15 billion. In principle, foreign portfolio equity investment and direct investment are quite distinct. By definition, foreign portfolio equity investment is distinguished from FDI by the degree of management control that foreign investors exercise in a company. Portfolio equity investors usually provide only financial capital without any involvement in a company’s management, and typically have a shorter-term investment horizon than direct investors. The latter have a significant and long-lasting management interest in the company in which an investment is made. In general, the dividing line between the two types of investment is the threshold of a 10 per cent equity stake. In practice, however, the distinction between the two categories of investment is often less clear-cut and is subject to a number of qualifications. The overriding motivation for investment by portfolio equity investors is their participation in earnings of local enterprises through capital gains and dividends. Transnational corporations tend to be more interested in accessing markets and resources and, more generally, in the contribution that an investment can make to the competitiveness of the transnational corporate system as a whole. The contrast in motives between TNCs and portfolio equity investors is not, however, always so stark. In the notable case of venture capital investment, the investment horizon tends to be somewhat longer than for foreign portfolio equity investment, and the existence of significant (and perhaps also long-term) management control is not unusual, although the foremost motivation is to share in the capital gains of the equity of a local enterprise when it is listed eventually on the stock exchange. … encouraged by the liberalization and globalization of financial markets and the growth of funds in the hands of institutional investors. Two major factors lie behind the rise in foreign portfolio equity investment flows into emerging markets: the liberalization and globalization of financial markets and the concentration of substantial financial resources in the hands of institutional investors. Investments into emerging markets have been facilitated by the rapid provision of market information made possible by improvements in communications technology and the willingness of portfolio equity investors to bear greater risks in the expectation of reaping higher returns in these new and fast-growing markets. The higher returns have been made possible by the sustained superior growth performance of emerging markets in comparison to that of developed economies during the 1990s. Stock market capitalization in emerging markets has also grown much faster than that in developed countries. However, as in the case of FDI flows, portfolio equity investment flows have remained skewed towards a small group of mostly upper middle-income emerging markets, along with two large low-income countries with impressive growth performances and prospects. (Asia alone accounted for 53 per cent of net foreign portfolio equity investment flows to emerging markets in 1995.) This is not surprising. For many large institutional investors, it is more attractive to invest in more mature emerging markets that tend to have a relatively large market capitalization and provide high liquidity levels, relatively fast and reliable settlement systems and a generally more developed market infrastructure. There is also a certain level of concentration when it comes to the origin of foreign portfolio equity investment flows. Over the period 1992-1994, it is estimated that more than 35 per cent of flows to emerging markets originated in the United States, 15 per cent in Japan and 11 per cent in the United Kingdom. In recent years, investors from Hong Kong and Singapore have also invested in emerging markets. For the United States, the most important source country, investment flows to emerging markets have followed the global trend, increasing substantially in 1993, decreasing in 1994 and 1995, and rising again in 1996, despite a clear upturn in stock-market returns in the United States. In light of the vastly increased volume of foreign portfolio equity investment flows to emerging markets, the impact of these flows on host-country economies is likely to be significant. Although such investments can make an important contribution to the financing of equity capital of local companies, concerns have been expressed by host countries particularly as regards the volatility of these flows and their effect on exchange rates. In order to address this issue, it is necessary to investigate the causes of that volatility and the availability of measures or mechanisms to reduce or withstand it. 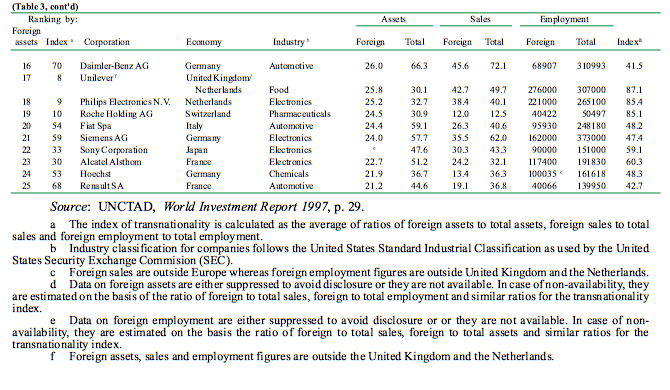 The growing size and importance of international production ... ... was manifested in 1996 in the $1.4 trillion worth of investment in foreign affiliates. 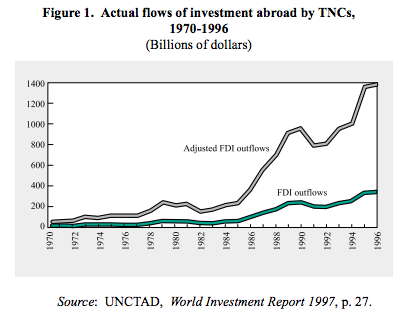 Foreign-direct-investment flows set a new record level of $350 billion, in the midst of a new FDI boom, ... ... with cross-border mergers and acquisitions and inter-firm agreements as the driving force behind TNC activity ... ... and with an increasing transnationalization of the largest TNCs based in both developed and developing countries. The growth of international production has been facilitated by ongoing liberalization ... ... and holds good prospects for being sustained into the next century. The United States is by far the largest FDI recipient and investor abroad,... ... but developed countries are becoming, on the whole, less important hosts. Developing countries — even some of the least developed ones — enjoy rapidly growing investments, ... ... with new record levels in South, East and South-East Asia, ... ... as well as Latin America and the Caribbean, ... ... with signs of revival of FDI flows to Africa ... ... and of growing non-oil investments in West Asia, ... ... while a slow-down in privatization contributed to a decline in FDI flows to Central and Eastern Europe. Accompanying the FDI boom, foreign portfolio equity investment in developing countries has also accelerated, ... ... encouraged by the liberalization and globalization of financial markets and the growth of funds in the hands of institutional investors.